April 15 BIR Deadline is coming! 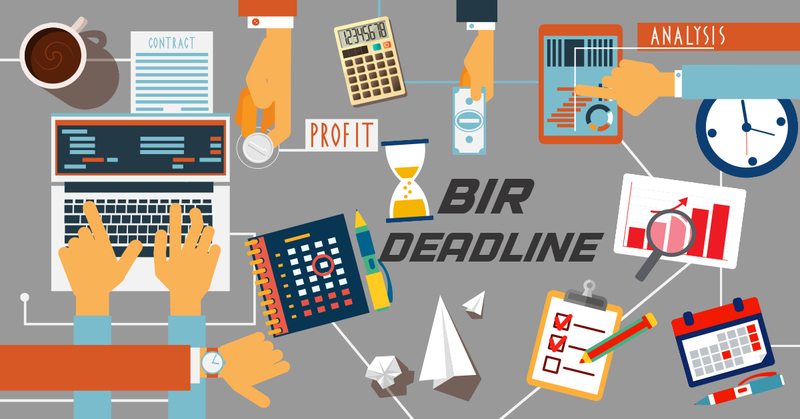 BIR Deadline is almost near! All Taxpayers are required to pass their Annual Tax Returns on or before April 15. Bureau of Internal Revenue has set the standard that every April 15th of the Year, Taxpayers must submit the individual Annual Income Tax Return (ITR) and the payment of the tax due. The question is, are you ready to beat the deadline? What are the things that you must consider? Filing with the SEC of AFS for YE 30 November 2018 by corporations whose securities are not registered under the SRC/RSA. e-Filing and e-Payment/ Filing and payment of 1702Q (ITR) for QE 31 January 2019. Submission of Inventory Lists for YE 28 February 2019. Submission of soft copy of books of accounts and other required documents for YE 28 February 2019 registered under CAS. e-Submission of SLSP for QE 28 February 2019 (LTS & eFPS filers). e-Filing and e-Payment/Filing and payment of 2000 (DST) for March 2019.
e-Submission of sales report using CRM/POS and/or other sales machine with TIN ending in even number for March 2019. Filing and payment of 1601-C (WTC) for March 2019 (non-eFPS filers). e-Filing and e-Payment/ Filing and payment of 1600 (VAT/PT withheld) for March 2019.
e-Submission of sales report using CRM/POS and/or other sales machine with TIN ending in odd number for March 2019. Issuance of 2306 (Certificate of VAT/PT withheld) for March 2019. Issuance of 2307 (Certificate of VAT/PT withheld) for March 2019.
e-Filing of 1601-C (WTC) for March 2019 (Group E). e-Filing of 1601-C (WTC) for March 2019 (Group D). Submission to PEZA of AFS and ITR filed with the BIR on 15 March 2019 by PEZA registered enterprises whose YE 30 November 2018. Submission to PEZA of Annual Tax Incentives Report by PEZA-registered enterprises for YE 30 November 2018. Filing and payment of 1700 (compensation earners ITR) and 1701 (self-employed/professional ITR) for YE 31 December 2018.
e-Filing of 1601-C (WTC) for March 2019 (Groups A, B and C). e-Payment of 1601-C (WTC) for March 2019 (all eFPS filers). e-Filing and e-Payment/ Filing and payment of 1702 (ITR) for YE 31 December 2018.
e-Filing and e-Payment/ Filing and payment of 1707-A (CGT) for YE 31 December 2018. Submission of bound loose-leaf books of accounts and other required documents for YE 31 March 2019 registered under loose-leaf. Monday Filing with the SEC of AFS/Annual Report for YE 31 December 2018 by corporations with license no. ending in 1 and 2 (first day). Filing and payment of 2550M (VAT or PT) for March 2019 (non-eFPS filers). e-Filing of 2550M (VAT) for March 2019 (Groups D and E). Issuance of 2307 (EWT Certificate) for QE 31 March 2019.
e-Filing of 2550M (VAT) for March 2019 (Group C). e-Filing of 2550M (VAT) for March 2019 (Group B). Remittance of HDMF contributions for March 2019 by employers whose names begin with letters M to Q.
e-Filing of 2550M (VAT) for March 2019 (Group A). e-Payment of 2550M (VAT) for March 2019 (all eFPS filers). e-Filing and e-Payment/ Filing and payment of 2550Q (VAT) for QE 31 March 2019.
e-Filing and e-Payment/ Filing and payment of 2551Q (PT) for QE 31 March 2019. Submission of SLSP for QE 31 March 2019 (non-eFPS filers). Filing with the SEC of AFS/Annual Report for YE 31 December 2018 by corporations with license no. ending in 1 and 2 (last day). Monday Filing with the SEC of AFS/Annual Report for YE 31 December 2018 by corporations with license no. ending in 3 and 4 (first day). e-Filing and e-Payment/ Filing and payment of 1702Q (ITR) for QE 28 February 2019.
e-Filing and e-Payment/Filing and payment of 1601-EQ, 1601-FQ,1602Q and 1603 (EWT, FWT and FBT) for QE 31 March 2019. Submission of Inventory Lists for YE 31 March 2019. Submission of soft copy of books of accounts and other required documents for YE 31 March 2019 registered under CAS. e-Submission of SLSP for QE 31 March 2019 (LTS & eFPS filers). Records tracking problems. Due to manual recording of data some records were sometimes misplaced or outdated making it hard for Accounting Department to trace all the company’s data and produce a comprehensive report for BIR purpose. Lack of Accuracy. Errors tend to happen when manual data and report preparation were done. Most of the time the report producer experiences inefficiency due to tedious effort in finalizing the needed BIR forms and reports. Past due Updates and Tasks. Accountants may forget about certain tasks that need to be done before the April 15 BIR Deadline. This causes unwanted delays, however some business software may keep track of past transactions and can generate reports for easier analysis. Consolidation of Data from Different Offices. Due to bulky transactions and different office locations, Medium and Large Enterprises have problem in organizing and combining company data and transactions. To eliminate these challenges, business software enables system users to access their data anywhere over the internet. Late filing has equivalent Penalties and here are the following Penalties imposed by the Bureau. Unless otherwise authorized by the Commissioner, filing a return with an internal revenue officer other than those with whom the return is required to be filed. Failure to pay the deficiency tax within the time prescribed for its payment in the notice of assessment. There shall be assessed and collected on any unpaid amount of tax, interest at the rate of twenty percent (20%) per annum, or such higher rate as may be prescribed by rules and regulations, from the date prescribed for payment until the amount is fully paid. Failure to File Return, Supply Correct and Accurate Information, Pay Tax Withhold and Remit Tax and Refund Excess Taxes Withheld on Compensation. To avoid errors and penalties it is recommended to use a BIR Ready Business Software . Always remember that, “Prevention is Better than Cure”!